Clip from the match commentary highlights of the F.A. 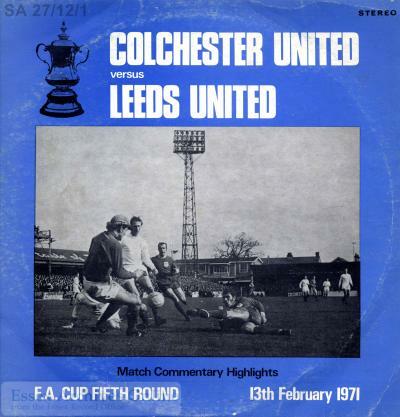 Cup fifth round football match between Colchester United and Leeds United at Layer Road, Colchester, on 13 February 1971 (SA 27/12/1). This match saw Colchester United, then in the 4th Division, beat Leeds United, who were in the 1st Division and were, at that time, regarded as one of the best teams both in the English league and in Europe. The record was released to provide a permanent reminder of this momentous match. The intonations in the commentator’s voices and the background crowd noise make this recording instantly familiar to any football supporter. What would a recording made in the same location sound like today? The team’s final match in their Layer Road stadium was played in 2008, after which they moved to their current Weston Homes Community Stadium. The site of the old stadium is now a housing estate, making this recording even more historically significant. Commentators: Jim Howe, John Palmer, Eric Southernwood and Godfrey Thomas. Produced and edited by Keith Southern. i went to this game as a kid with my dad. Always remember it like yesterday. Thanks for sharing! Does the recording sound as you remember it?